This is my first anniversary prize for my blog giveaway, everything in the top photograph is the first prize and the contents in the second photograph is the second prize. There is a third prize of 6 fimo clay pins of various colours, unfortunately I did not take a photo of the pins but they are similar to the ones in the photo's. (Both photo's are clickable for a close up view) I cannot believe it is 12 months since I first started blogging, what a journey it has been, I remember how nervous I was about posting my first picture thinking would anyone comment, would anyone like visiting my blog, would anyone return? Thankfully I did get some lovely comments and many of you have visited me often, I have made many friends who have the same passion for cross stitch and other crafts as I do, and I thank you all for your friendship. In particular, I remember looking at blogs with blog awards wondering how people got them, I was so thrilled when I received one of my first awards from Lizzy ( A Stitching Faery's Rambling Under the Willow Tree ). Then there was Cindy F, what a thrill it was to meet Cindy, she has made me laugh so much over the last month's, her emails are sooooo funny, in fact my husband always says " Oh I see you must have got an email from Cindy"! I was thrilled to be chosen for PIF gift from Andrea ( The Craft Room ) and I can still remember the excitement of receiving that gorgeous pinkeep that Andrea made, it is proudly displayed where I can see it everyday. I was also involved in three personal exchanges with Jill, Mylene and Jennifer and I received some beautiful stitching from these ladies, it sure made me look forward to the post arriving each day. There are so many people I could mention but I would be here all night, however I would like to thankyou all for visiting my blog and I hope you enjoy looking at the photo's of my first anniversary gifts. And now the rules for the giveaway! The pin cushion is my own design. You have until the 31 August to leave a comment and I will announce the winner on Saturday the 5 September. I know it's quite a long time but I am away most of the month of August. I look forward to reading your comment's and announcing the winners! A blog award and holiday preparations. I have received a blog award from Wendy , thankyou Wendy I have always wanted this pink one! I am supposed to choose 15 blogs to pass this on to but on this occasion I am going to pass it on to everyone who sees this post as I will find it very difficult to choose 15 blogs from all of the wonderful blogs I read out there! I am very busy stitching my first anniversary gift for publication next Friday 31 st July, it will be left open until 31st August as I am away most of the month, but it gives everyone a chance to enter, I think you will all like what I am stitching, I am looking forward to seeing your comments on it! I would also like to thank everyone for visiting my blog, I was particularly thrilled the other day when I hit 100 followers, thankyou so much everyone. Have a lovely stitchy weekend! Here is the lovely tea exchange that I received from Jennifer, I absolutely love it, especially because it is in my favourite colour - pink of course! I first met Jennifer through the Hooked on Exchanging group when Jennifer sent me a beautiful mattress pincushion (here) in one of my first exchanges. 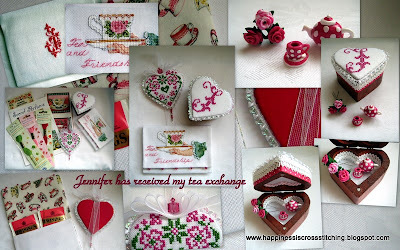 Jennifer included various flavours of tea, pink silk thread, ribbon with a tea cups design, a Sajou thread winder and a french cross stitch pattern. Thankyou Jennifer for a lovely exchange! I am currently putting the finishing touches to my first anniversary giveaway, apart from that I have not much stitching to report. I have also received a blog award from Wendy, however I will post about that in my next post. Thankyou for all of the lovely comments on the tea exchange that I sent to Jennifer, I really appreciated them all. My tea exchange has arrived at it's new home! My tea exchange to Jennifer has arrived, she has emailed me to say she loves it! I was so pleased it arrived safely, I wonder how many cross stitchers hold their breath until the items finally arrive, I was thinking I might need oxygen I held my breath for that long! I included a mahogany box with a fimo clay teapot and roses, a teabag holder, tea printed fabric and DMC threads that were perfumed with roses, apple and strawberries and a hanging heart ornament. All cross stitch pattern information is available below but I cannot remember where I got the letter J for the mahogany box - I will try to find it and post it later. I made the little teapot, cup and saucer and roses from fimo clay, I did not have the correct cutters to make a decent saucer but it was my first attempt, ( all you miniature artists look away now) LOL! I was pretty pleased with the little teapot, I had to make three to get it right but I absolutely loved making it, in fact I feel another addiction coming on! I followed the Christel Jenson videos on You Tube for instructions on how to make the teapot, the roses were also a You Tube video, just type in fimo clay roses. I love anything pink and twinkly so Swarovski Crystals are a must, I also knew that Jennifer likes pink and green! The pattern for the heart is a freebie from Zoes blog here. The teacup and saucer pattern is from 50 Tiny Tea Motifs pattern book by Jorja Hernandez, published by The American School of Needlework. Jennifer sent me one of my first ever exchanges last year, she made me a gorgeous mattress pincushion that I loved, you can see pictures here. It was such fun stitching this for you Jennifer and I am very pleased you liked it. I do hope you enjoy looking at my latest creations as much as I have enjoyed making them. I am now concentrating on my first blog anniversary for 31 July 2009 so please don't forget to return and join in the fun. I will post it on that date but I will not be drawing it until I return from my holidays in September, that wil give everyone a chance to leave a comment and not miss out! Happy stitching and thankyou for visiting! Wendy has received my Christmas In July Exchange for the Hooked on Exchanging group, I stitched a Prairie Schooler Ornament from the Winter booklet. I included some Christmas fabric, 2 packets of ornaments and some DMC threads that smell of strawberry and apple. It was a pleasure to stitch this for you Wendy. Jennifer should receive the exchange I sent last week, hopefully she should get it today or tomorrow, I will post pictures as soon as I hear. Happy stitching everyone, thankyou for your visit and the lovely comments you leave! Hi everyone, I hope you are enjoying the summer sunshine, however these pictures will make you feel quite chilly as I have a few winter Christmas ornaments to show. The picture above is the ornament I have stitched for the Christmas Challenge blog, I was a few days late for the June ornament but I finally managed to get it finished, it is a Prairie Schooler pattern stitched on 28 count and made into a little felt pillow. I really love this Christmas Challenge because it makes me adhere to my Christmas stitching, I can't believe there are only 6 more ornaments to make for Christmas, where does the time go? The pictures below show the lovely Christmas in July exchange I received from Ellen L for the Hooked on Exchanging Too blog, as you can see from the pictures Ellen was very generous with the extras! Thankyou Ellen I love it all. I have sent my tea exchange to Jennifer this week so I will have some photo's to show probably by the end of next week. I have started to stitch my July ornament for the Christmas Challenge blog as I do not want to be late this next time, and I am concentrating on the Prairie Schooler round 3 exchange for August and my first anniversary blog giveaway on the 31 July 2009. Happy stitching everyone, thankyou for your visits and the lovely comments you leave, I really appreciate them all.